This one is pretty subdued, as far as glitters go. 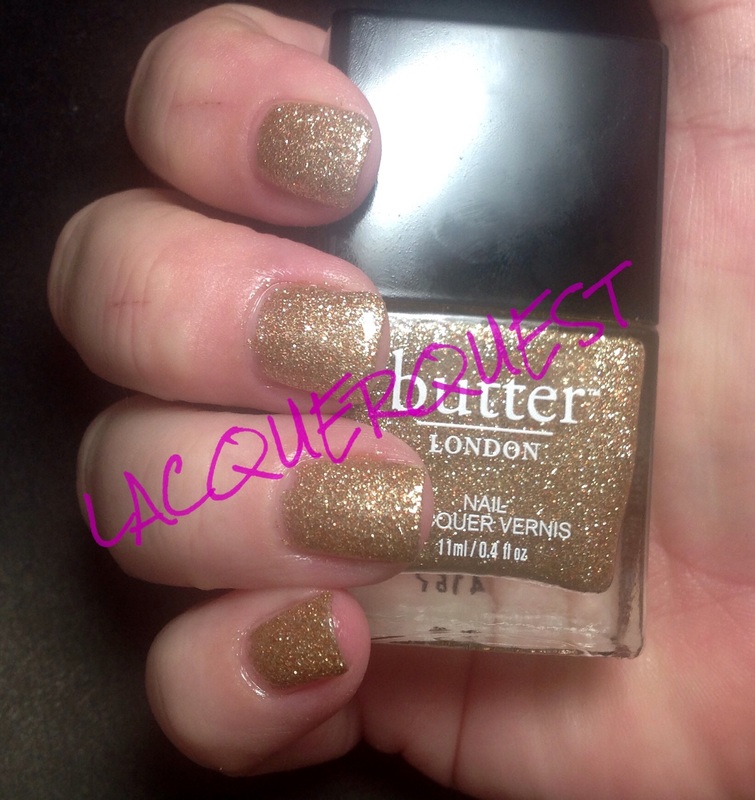 You might like All Hail the Queen, it’s more of a beige sparkle, more like a glass fleck than a glitter. I’ll try to remember to put that on the list to do soon so you can check it out. I just finished a fresh manicure or I’d do it tonight. Tomorrow morning I’m watching my baby niece, so I’m going to see if I can get some pictures uploaded from my laptop in the peaceful time before she wakes up when I’m at loose ends. I’m pretty sure there’s at least one more BL in that batch! OMG! Did you just say what I think you said!?!?!? Excuse me? Since when do I have a problem communicating? Do you store your bottles any special way to make them last longer? I’ve got a couple of colors that I LOVE LOVE LOVE (Yes, I’m talking to YOU, OPI Deer Valley Spice) and want to hold on to them as long as possible. I always heard to keep your polish in the refrigerator and it will stay just like new. I’ve never heard that, the only polish I ever kept in there was a bottle of clear back in the dark ages when I wore hosiery. So, I googled it…. The first hit says put your polish in the refrigerator, it keeps the solvents from thickening. The second hit says NEVER put your polish in the refrigerator, because it will make it thicken more. So, who knows? I thought the latter before I looked it up, so I’m going with that. It’s a moot point for me, anyway. If I put all my polish in the icebox, I wouldn’t have room for anything else! You should always store your bottles upright, but that’s mostly to keep the brush submerged so parts of it don’t dry and ruin the whole thing. It’s also tougher to mix back together if the pigment has started to separate. The only line that I have consistent problems with it separating is China Glaze, but they have mixing balls, so a few minutes of good, hard shaking mixes it back nicely. The only OPIs I have that separate are white based cremes, like Gargantuan Green Grape. It’s actually kind of neat, the color on top looks like syrup on ice cream. The only OPI I’ve had get goopy or dried out are in mini bottles. But if your polish does get thick, DON’T use acetone or polish remover! Use polish thinner (an 8 oz bottle is like 1.97 at Sally and will last forever) or, if you want to go fancy, Seche Restore. ES, is that lyricallly speaking over yet?